I am officially moved in! I have finished moving all of my posts from my WordPress blog onto BlogSpot! I can FINALLY start posting new things! It’s rather exciting. 🙂 There’s still a few things that I have to adjust, but all my old posts are finally up there, so it’s all good! I don’t have the heart to delete my old blog, so I think I’m just going to leave it alone for now. Maybe I’ll delete it one day. I want to thank everyone and anyone who has checked out this blog. I appreciate it so much! It’s LinZ. I am in the process of moving my current nail blog from WordPress to BlogSpot! Hello! I know I’ve been AWOL for a few days. I haven’t stopped painting my nails. That will never happen. But I have been too busy/lazy to post anything. So this post is for you to know I’m alive and to tell you what’s new and what’s coming. I added a new page at the top. It’s called “Nail Design List”. It’s just an organized list of all the nail design posts I have. So instead of searching through all the long posts that I’ve made, you can just go to the List and find the design you’re looking for super quickly. Click the link to check it out! I hope you don’t mind my few days of hiatus! But I will be back! I PROMISE. Nothing can keep me away from this blog for long! This is a monumental day. 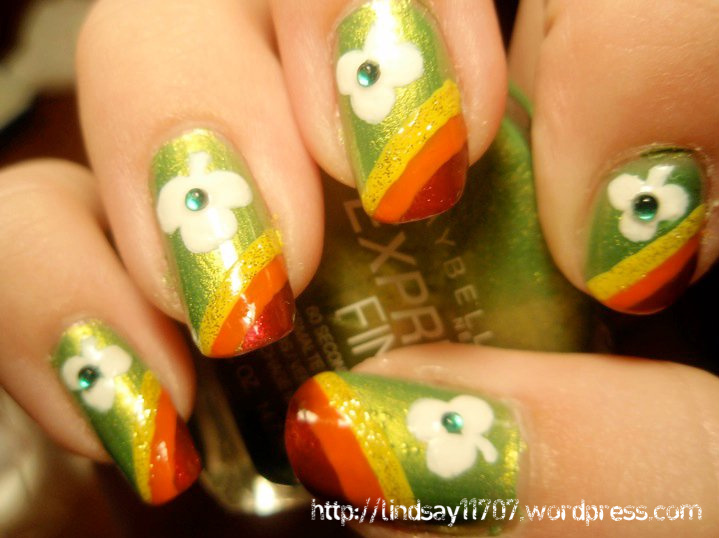 This is my first post on my nail blog. This is the design I used for MY prom. Unfortunately, the nails were better than the actual prom. Yes. I did my nails for St. Patrick’s Day. I thought they were okay, but everyone seemed to love them.